If you’ve ever thought of starting a business, franchising has probably crossed your mind. Franchising can be a great opportunity for highly motivated people since everything needed for success is already neatly packaged for potential owners. There are a plethora of franchises available so the problem can be knowing which one to choose. If you’ve wanted a business that will not only earn you money but also positively impact the lives of others, in this case children, opening up your own Mathnasium franchise could a be a perfect fit. Here’s what you need to know. Mathnasium is a franchise that caters to children needing help with math. Mathnasium was ranked the 37th fastest growing Franchise by Entrepreneur magazine in 2015 and currently has over 600 locations across the country. Mathnasium instructors help students who are struggling with math approach problems in new ways. They aim to transform the way children think of math so that they can better understand and ultimately, excel. They don’t believe in one-size-fits-all approaches and instead give individual solutions. Each student is “diagnosed” and given their own special curriculum. Hands down, being able to earn money while helping struggling students excel in school and improve their self-esteems sounds like a great business model. But is this really a good investment? Let’s look at some numbers. As you can see most of these are one-time expenses and are necessary to get your business off the ground. You can also get a clear picture of what’s going to be expected from you on a monthly basis. Since this is a Franchise opportunity you’d also be getting almost everything needed to run your business right from the get-go. This would include the Mathnasium Method of teaching, multiple trainings and instructions on what to charge and how to market your business. What makes Mathnasium a great opportunity is that this business focuses on one subject. When children are given an individualized plan to improve their skills in one area the results are going to be much higher than if tutored on all subjects like many other learning centers do. And since two thirds of students are scoring below proficient in math once they hit the eighth grade level, tutoring is in high demand. 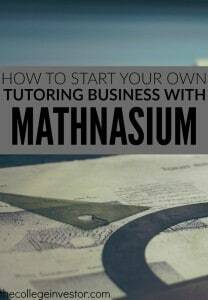 Mathnasium could be a great opportunity if you’re looking to invest in a service type of business. However, to make this work you’ll need to not only want to help students, but also possess some business savvy. While Mathnasium will provide you tools to get your business off the ground your success will ultimately depend upon yourself. If you’re willing to put in the hours and hard work required, Mathnasium could be a worthwhile investment. You can learn more about opening a Mathnasium franchise here.